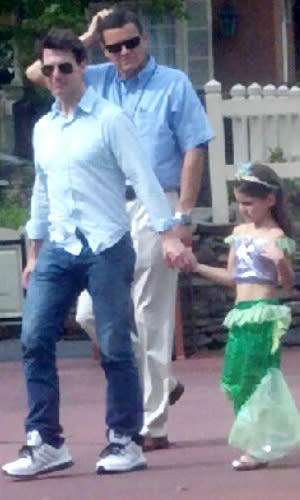 Tom Cruise has been pulling out all the stops when it comes to daughter Suri lately. Since his split with wife Katie Holmes six weeks ago, the actor has turned his solo visits with his 6-year-old into fun and exciting excursions — helicopter rides, beach days in the Hamptons, and even a trip to Disney World last week. But the father-daughter duo didn't just take a ride on Space Mountain and spin on the Tea Cups and call it a day. Cruise, 50, also arranged for a once-in-a-lifetime experience for his little princess by booking the ultra-exclusive Cinderella Castle Suite. 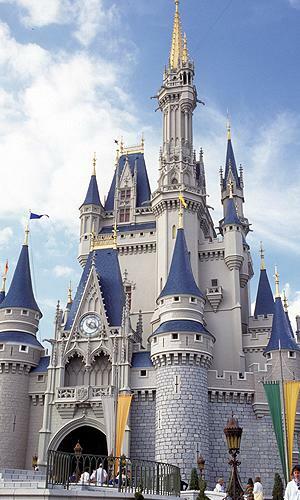 The luxurious digs are actually inside the Magic Kingdom's iconic castle and feature plenty of ornate details to make any little girl's dreams come true. Guests enter by an elevator activated by a key-to-the-world card, which drops in them in a Cinderella-themed foyer, featuring the fairy tale's famous pumpkin coach made out of thousands of mosaic tiles. The space was originally created to be an apartment for Walt Disney, but he died before it was completed. 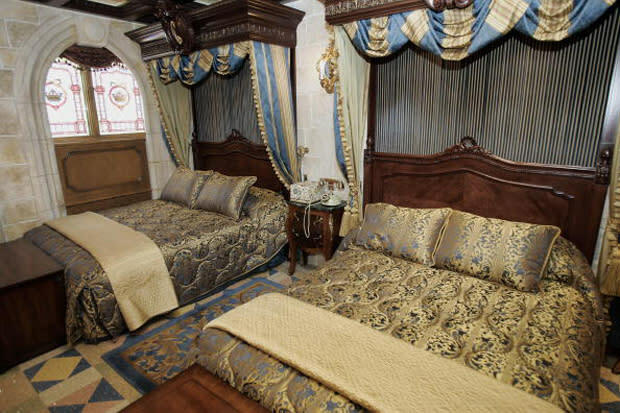 According to Tom Bricker, who owns DisneyTouristBlog.com and has gotten two tours of the suite since it opened in 2007, "It's typically not open to the general public and it's not available for any nightly rate. It's seldom used." As for how Cruise got in: "It's been implied that the celebrity makes a donation to charity, but it's not really known for sure." This was reportedly not Cruise's first stay and other celebs, including Mariah Carey, have previously been granted permission to take up residence for the night. The suite — which consists of a bedroom, bathroom, and den, but is still on the small side — comes with a 24-hour VIP concierge and (as Bricker was told a few years back) an engraved glass slipper worth $18,000 for VIP occupants to take home. And for those looking to watch their favorite Disney movie before bed, it may not look like there's much technology in the 17th-century-themed suite, but that portrait of Cinderella above the fireplace in the bedroom actually turns into a flat-screen TV, as does the mirror in the den. "The suite as a whole is pretty ornate and extravagant," says Bicker. Nothing but the best for Tom and Suri!